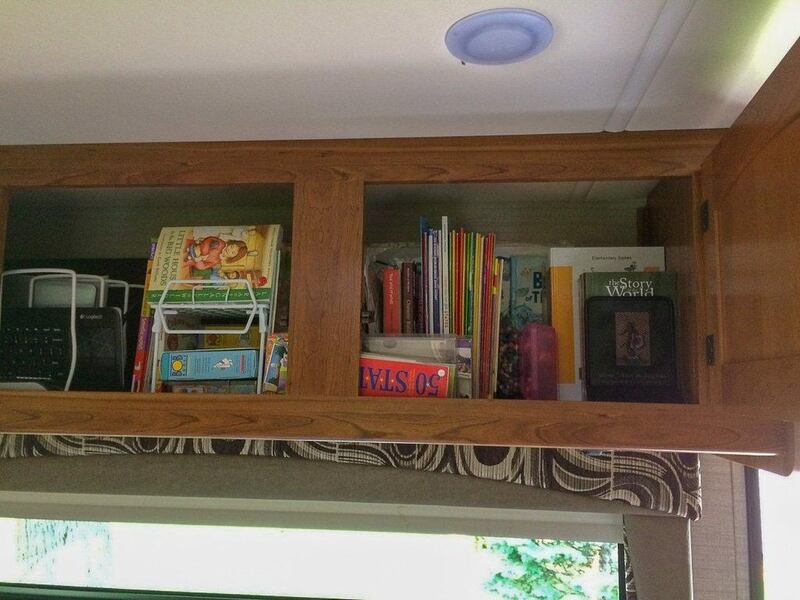 Have you ever thought about living in a motorhome full time with kids? How in the world does everything fit? Where does everyone sleep? Our family of 6 lives in a 33-foot class-C motorhome while we travel the country full time. That's right, we live in less than 300 square feet of indoor living space with 4 kids! 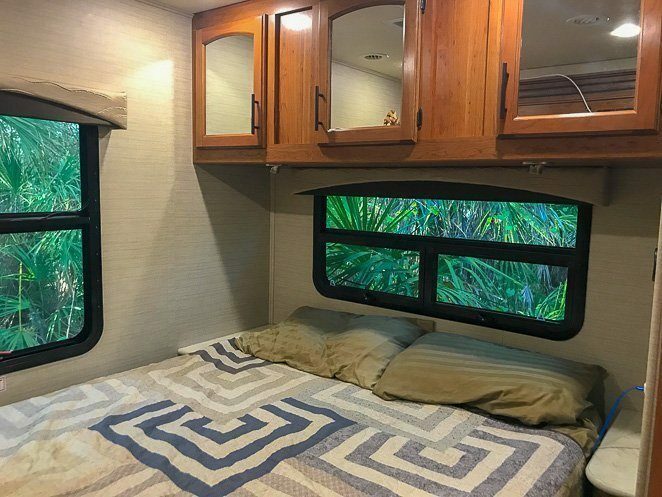 Get a peek at the inside to see what motorhome living is really like! 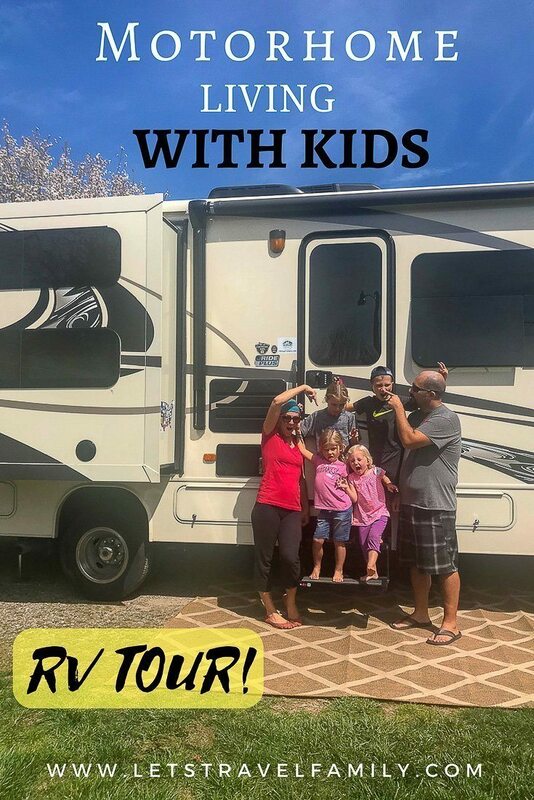 Watch our full time family RV tour below! 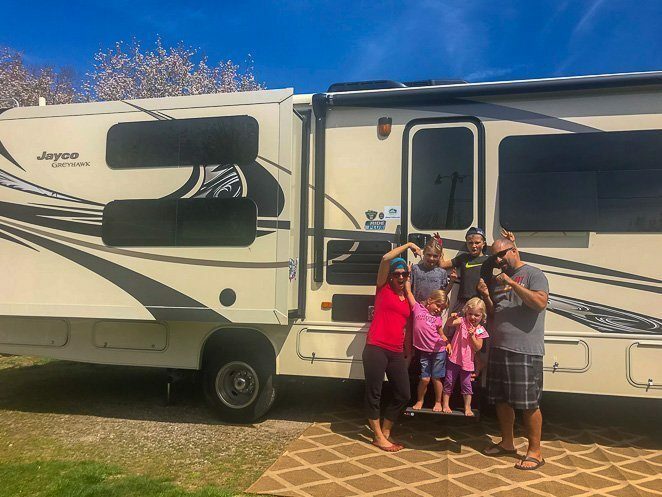 If you are not up for watching the video, or you want a more in depth look at what living in a motorhome full time looks like, then keep on reading. 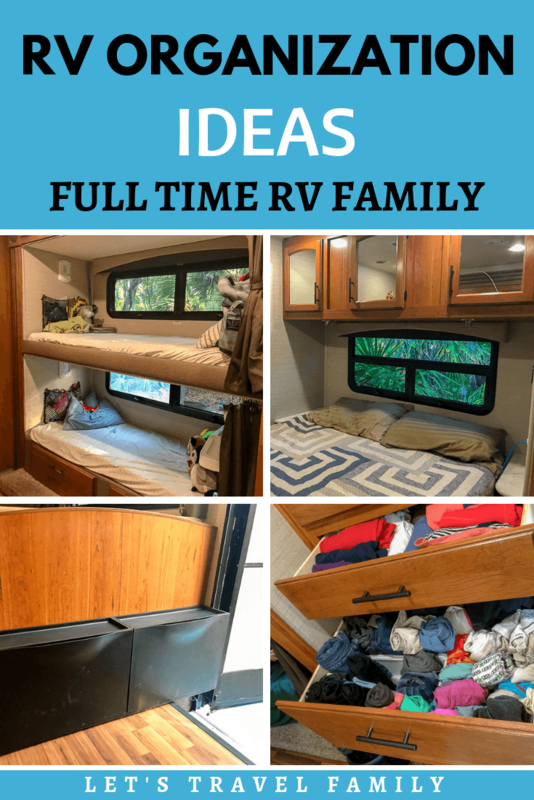 I'm going to provide several photos of how we organize our living space to make it the best RV for full time family living and allow the 6 of us to live together in harmony. First, I want to quickly touch on why our family loves the RV lifestyle. I'm telling you, we really do love this RV lifestyle. I love: the ability to visit new destinations each week, get the family outside more, meet new friends, spend more time together as a family, and living like minimalists. Our kids love: meeting new friends each week, finding awesome swimming pools, and having less toys to clean up. Tony loves: being able to work outside many days, being with the kids and I MUCH more than he used to be, and having less 'stuff' or 'clutter' in our home. So what does all that have to do with living in a motorhome full time? Well, we appreciate having our own beds, our own 'me' space, our own food, and a place with heat and air conditioning that we can call home. We also LOVE that our home is on wheels and that we can enjoy our traveling lifestyle while bringing the comforts of 'home' along with us. Click here if you are just getting started and want more RV living tips. Type Of RV - Why a Class C? 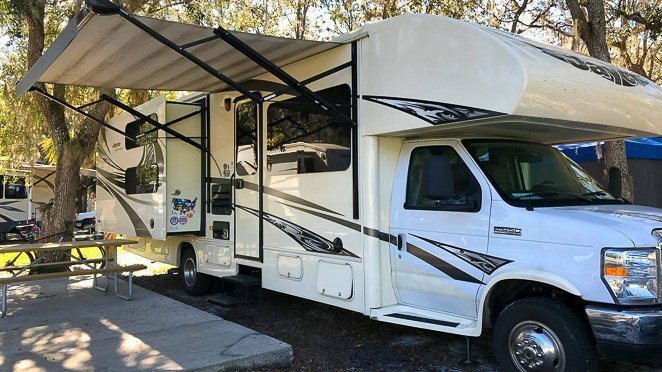 Particularly, we are happy to have a class C motorhome instead of a travel trailer or fifth wheel. Why exactly is that? We have friends that love living in a travel trailer full time. They have a used truck and used travel trailer that they paid cash for, which allows their overhead expenses to stay low. 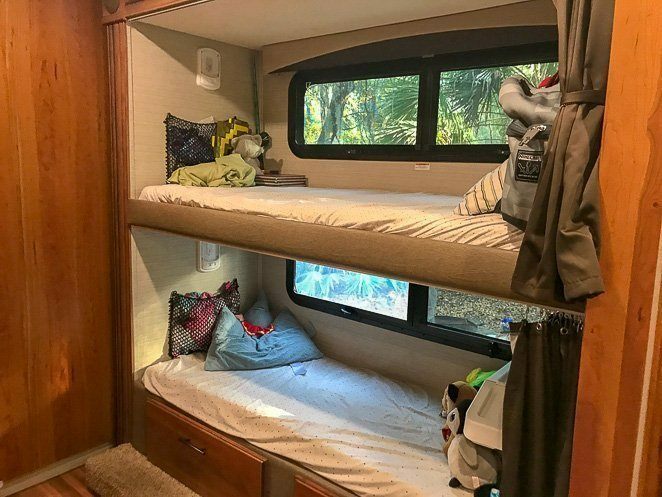 They fit a family of 5 in their travel trailer and have made an amazing home on wheels. We were not in a position to pay cash for a truck or RV when we launched, so that would have been two loans. Our family also needed to find a truck with seatbelts for 6 and that is also very difficult to find. There are also many full time traveling families that love living in a fifth wheel full time. Fifth wheels often provide more head space with higher ceilings, more outdoor storage, and in particular the bunk house editions are referred to as a 2 bedroom apartment with 'real' doors. 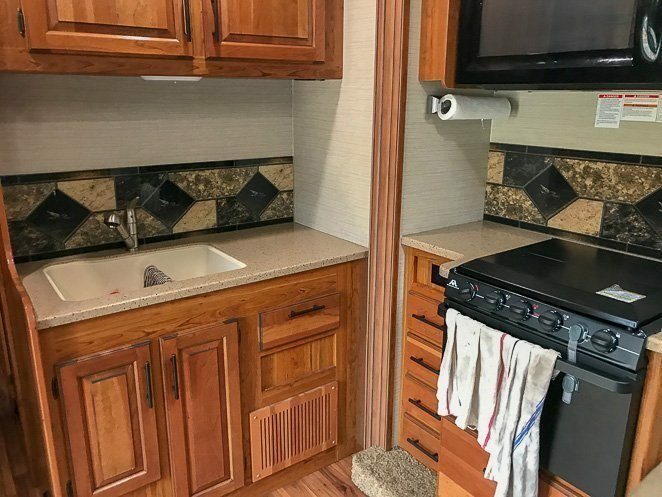 Yet, the size of a fifth wheel can often limit which campgrounds you can fit in, along with the necessity of a heavy duty truck to pull it with. As a family of 6, we knew that we would be limited on our options for 4 children in carseats or booster-seats all fitting in a truck. Why not a class A motorhome? 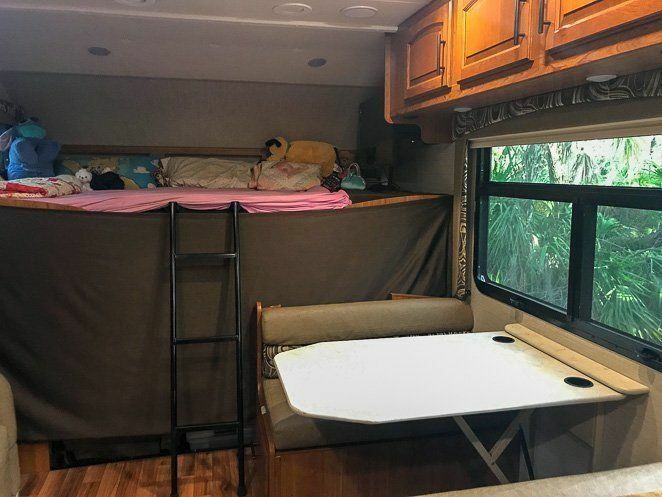 Most layouts of class A motorhomes do not have enough beds for a family of 6, without having to set up the couch or table into a bed each night. Furthermore, class A motorhomes were often higher in expense, even if they did come with a preferred diesel engine. Tony and I did briefly talk about diesel motorhomes, yet decided against them. Now, another option that we briefly looked into were super C motorhomes. They come with a diesel engine, which would have been amazing. Yet, they were much higher in price and we did not want to break the bank. 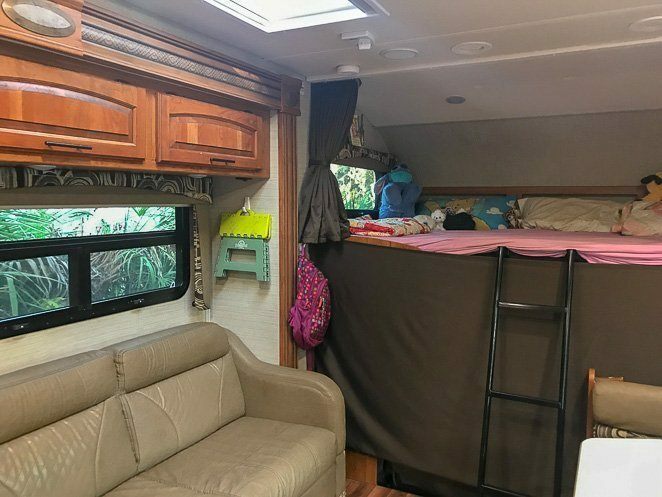 Our class C motorhome with a bunk slide allows each of us to have our own bed and space that does not have to be set up or taken down each night. It also allows us to fit in most campgrounds, being only 33 feet long. More specifically, we feel that our Jayco Greyhawk is the best Class C RV for full time living. Maybe it's because we are bias, or maybe it's because it has worked so well for us during our 2 years of full time RV living and traveling. Yet, we do feel it's the best family motorhome you can find. Where Do We Each Sleep? 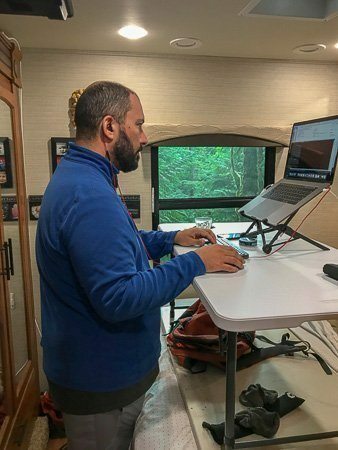 If you did not get a chance to watch our quick RV walk through video above, then I hope these photos and explanations help you get a good idea of how we all fit. I mean sleep 😉 . We have a motorhome with bunkbeds! Our oldest Riley, and youngest Jasmine sleep on the bunkbeds while keeping their toys and special belongings at the foot of their beds. Since our kids are still young and short, this works well for our family. Riley and Jasmine's beds in the bunk slide of our motorhome. Mom and Dad's 'short queen' bed in the back bedroom of the motorhome. Our two middle children, Lilya and Gwendolyn, sleep on the bunk over the cab of our class c motorhome. They sleep with their heads at the front of the RV and their feet near the ladder. They are both short enough that their feet don't hang off the bed and then we are not concerned about them rolling off the bed without a railing. They also have a curtain that helps give them privacy. Lilya and Gwen's bunk bed over the class c motorhome cab. If the weather isn't great for outdoor eating, then we eat at our kitchen table. The 4 kids usually sit to eat while Tony and I either stand at the counter or sit on the couch to eat. To be honest, we have been known to eat in shifts. For instance, if the kids are busy playing and the food is ready, Tony and I eat quick while we can. As I'm sure you know, being a parent at meal time often means that you are managing toddler meltdowns, request for seconds, a spilled milk episode, and more! Our kitchen table seats 4 and folds down into a bed. Tony and I came up with a great solution to a working desk! If it's raining or cold outside, then we can set it up inside on our bed in the back bedroom. However, if the weather allows, Tony will tell you that he much prefers setting up his desk outside. Tony and I use two tables as a stand up desk set-up. 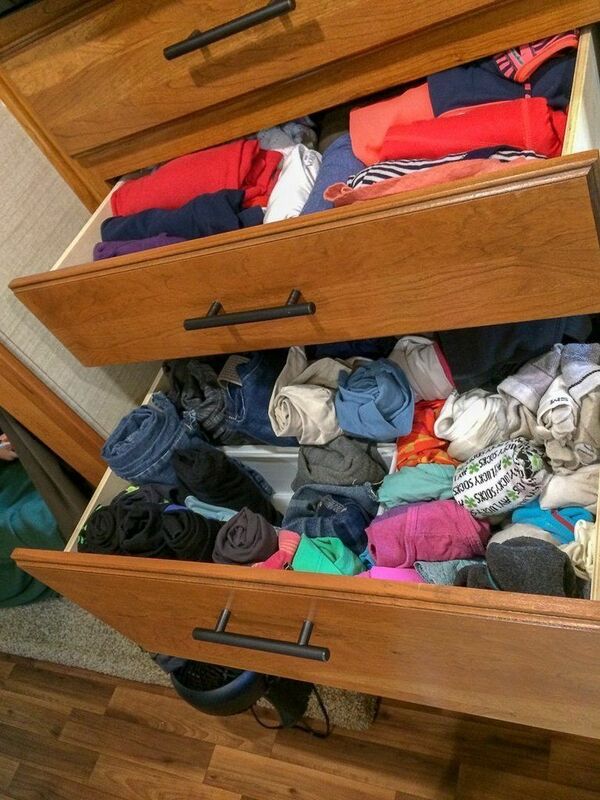 Each person in our family has 1 drawer to keep his or her clothes in. I know what you are thinking....how in the world do you fit it all? Well, we first decided to live like minimalists. So we were up for the challenge to downsize our wardrobes. I also learned a trick to fitting more clothes in a drawer is to roll your clothes. In our deep drawers, we use inserts from IKEA to help divide our clothes to help stay organized. Roll your clothes to fit more into your drawers. I do have a few extras for the kids that I want to hold on to for when they grow 2 inches in a week or when they get a huge hole in their favorite pants. I store these extra clothes in duffle bags under our Queen bed, which is our indoor 'storage' area. Where Do We Put Our Shoes? In the video tour, I mention that we use the 'black bins' for our shoes. I wanted to share with you what they are actually called and where we bought them. 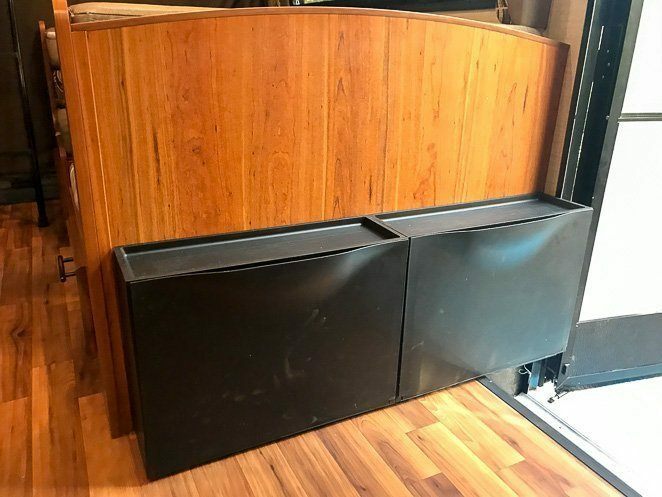 These black bins are called Trones, and we purchased them from IKEA. Where Do We Put Our Homeschooling Materials? As a family that travels full time, our children do not go to a typical school. They learn by experience and exposure while visiting new destinations. We use iPads with great educational apps such as Tynker and SplashMath, access to 2 laptops to practice things like typing on Typsee or watching Youtube videos with me about cooking. We also travel with a kindle that our oldest reads every day before bed or in the car on travel days. Yet, at times it's nice to take out an actual book or workbook. We store our books, materials and board games above our kitchen table. Homeschool books and workbooks fit well with bookends. To be honest, before we began to travel full time in our RV, I thought I would cook outside more on the grill. In reality, I find that we only grill 1 or 2 times per week. Otherwise we use our stove top, microwave, and instantpot the most. 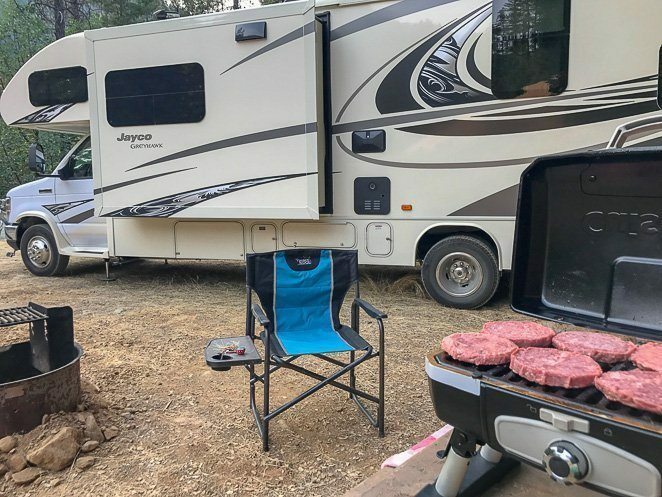 Click here to read all about how to cook in a motorhome and check out some of our favorite RV camping meals! We grill a few times a week, so outside cooking does occur. Where Do We Store Our Food? 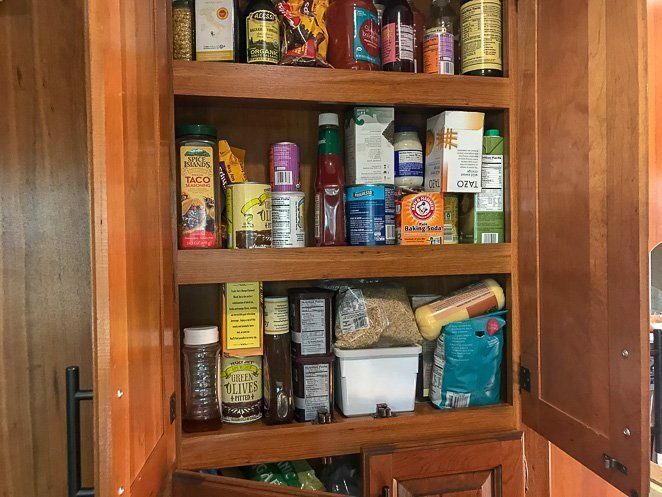 Our RV came with a linen closet in the hallway, that we use as our pantry. 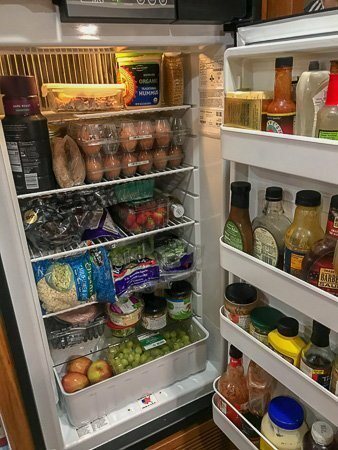 🙂 I knew that we needed more space for food, so it took priority. You would be surprised how many bags of groceries I can purchase and still manage to find room to store it! Living in a motorhome full time with 4 kids requires us to plan out our meals each week. With such a small refrigerator and freezer, we do find ourselves playing a game of 'Tetris' in order to fit leftovers after a meal into the refrigerator. How Do We Have Enough Drinking Water? With such a small refrigerator, we don't have room to keep bottled water inside. Also, while traveling to different campsites, we have found that the quality and taste of the water out of the faucet is not the best. That's why we are very dependent on our Travel Berkey water filter. It actually PURIFIES our water, while leaving the healthy minerals we need in the drinking water. 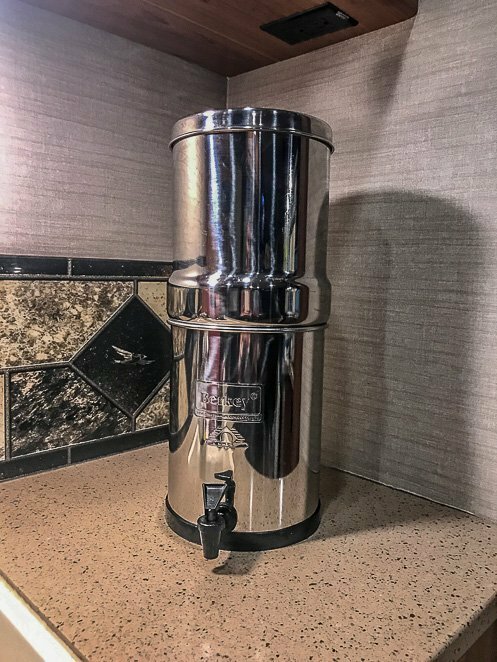 We use our Berkey for all of our drinking water. Where Do We Store Our Bathroom items? 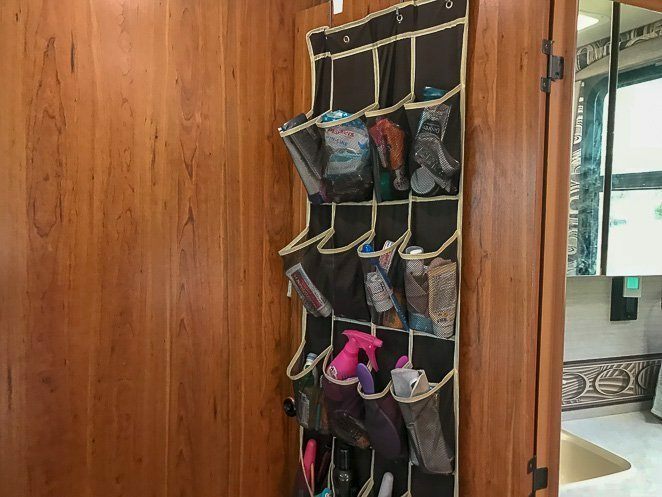 We use the cupboards above our bed to store towels, and the door organizer to store our bathroom supplies. We also were fortunate enough to have a large medicine cabinet and 2 shelves in our bathroom to help with storage space. Back of the door organizer is SO useful in an RV. Tony works for a great company doing the 9-5 gig. 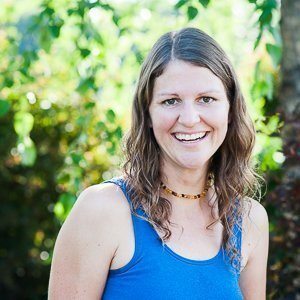 While Jill started a travel blog and teaches English online to children in China. We also have a great list of 25 ways to earn money while traveling, check it out here. If you want to learn how to start a travel blog to make money, then be sure to check this out. Now that you've taken a tour of our home on wheels, what else are you curious about? Do you have dreams of selling it all and traveling full time? Or, are you hoping to take an extended trip across the country in an RV? Maybe you just want to plan a family vacation and are looking for encouragement to make a leap and travel more with your kids. Either way, do not let your doubts hold you back. Find a way to make traveling together and connecting as a family be a priority! ​Read all about our first year of full time traveling with kids here. Leave a comment below and let me know what your family travel dreams are.